For other uses, see Informant (disambiguation), The Informant (disambiguation), Informer (disambiguation), and The Stool Pigeon (disambiguation). Two page totally confidential, direct and immediate letter from the Iranian Minister of Finance to the Minister of Foreign Affairs (Hossein Fatemi) about creating a foreign information network for controlling smuggling, 15 December 1952. An informant (also called an informer) is a person who provides privileged information about a person or organization to an agency. The term is usually used within the law enforcement world, where they are officially known as confidential or criminal informants (CI). It can also refer pejoratively to someone who supplies information without the consent of the involved parties. The term is commonly used in politics, industry, entertainment and academia. Informants are commonly found in the world of organized crime. By its very nature, organized crime involves many people who are aware of each other's guilt, in a variety of illegal activities. Quite frequently, confidential informants (or criminal informants) will provide information in order to obtain lenient treatment for themselves and provide information, over an extended period of time, in return for money or for police to overlook their own criminal activities. Quite often, someone will become an informant following their arrest. Informants are also extremely common in every-day police work, including homicide and narcotics investigations. Any citizen who provides crime related information to law enforcement by definition is an informant. The CIA has been criticized for leniency towards drug lords and murderers acting as paid informants, informants being allowed to engage in some crimes so that the potential informant can blend into the criminal environment without suspicion, and wasting billions of dollars on dishonest sources of information. Informants are often regarded as traitors by their former criminal associates. Whatever the nature of a group, it is likely to feel strong hostility toward any known informers, regard them as threats and inflict punishments ranging from social ostracism through physical abuse and/or death. Informers are therefore generally protected, either by being segregated while in prison or, if they are not incarcerated, relocated under a new identity. Informants, and especially criminal informants, can be motivated by many reasons. Many informants are not themselves aware of all of their reasons for providing information, but nonetheless do so. Many informants provide information while under stress, duress, emotion and other life factors that can impact the accuracy or veracity of information provided. Law enforcement officers, prosecutors, defense lawyers, judges and others should be aware of possible motivations so that they can properly approach, assess and verify informants' information. Generally, informants' motivations can be broken down into self-interest, self-preservation and conscience. Elimination of rivals or unwanted criminal associates. Elimination of competitors engaged in criminal activities. Diversion of suspicion from their own criminal activities. Fear of harm from others. Threat of arrest or charges. Desire for witness protection program. Genuine desire to assist law enforcement and society. Corporations and the detective agencies that sometimes represent them have historically hired labor spies to monitor or control labor organizations and their activities. Such individuals may be professionals or recruits from the workforce. They may be willing accomplices, or may be tricked into informing on their co-workers' unionization efforts. Paid informants have often been used by authorities within politically and socially oriented movements to weaken, destabilize and ultimately break them. 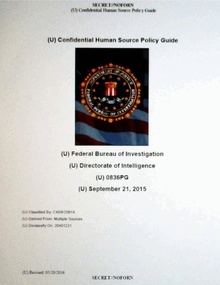 A redacted version of the FBI policy manual concerning the use of informants. Informers alert authorities regarding government officials that are corrupt. Officials may be taking bribes, or participants in a money loop also called a kickback. Informers in some countries receive a percentage of all monies recovered by their government. Lactantius described an example from ancient Rome involved the prosecution of a woman suspected to have advised a woman not to marry Maximinus II: "Neither indeed was there any accuser, until a certain Jew, one charged with other offences, was induced, through hope of pardon, to give false evidence against the innocent. The equitable and vigilant magistrate conducted him out of the city under a guard, lest the populace should have stoned him... The Jew was ordered to the torture till he should speak as he had been instructed... The innocent were condemned to die.... Nor was the promise of pardon made good to the feigned adulterer, for he was fixed to a gibbet, and then he disclosed the whole secret contrivance; and with his last breath he protested to all the beholders that the women died innocent." Criminal informant schemes have been used as cover for politically motivated intelligence offensives. Jailhouse informants, who report hearsay (admissions against penal interest) which they claim to have heard while the accused is in pretrial detention, usually in exchange for sentence reductions or other inducements, have been the focus of particular controversy. Some examples of their use are in connection with Stanley Williams, Cameron Todd Willingham, Gerald Stano, Thomas Silverstein, Marshall "Eddie" Conway, and a suspect in the disappearance of Etan Patz. The Innocence Project has stated that 15% of all wrongful convictions later exonerated because of DNA results were accompanies by false testimony by jailhouse informants. 50% of murder convictions exonerated by DNA were accompanied by false testimony by jailhouse informants. Stikker — Danish term meaning "stabber". Mainly used in relation to World War Two. canary — derives from the fact that canaries sing. "Singing" is underworld or street slang for providing information or talking to the police. dog — Australian. May also refer to police who specialize in surveillance, or police generally. ear – someone who overhears something and tells the authorities. fink — this may refer to the Pinkertons who were used as plain-clothes detectives and strike-breakers. grass or supergrass, — rhyming slang for grasshopper, meaning copper or shopper and having additional associations with the popular song, "Whispering Grass", and the phrase snake in the grass. narc — a member of a specialist narcotics police force. nark — this may have come from the Romany term nak for nose or the French term narquois meaning cunning, deceitful and/or criminal. pentito — Italian term, meaning "one who repents." Usually used in reference to Mafia informants, but it has also been used to refer to informants for Italian paramilitary or terrorist organizations, such as the Red Brigades. rat — informing is commonly referred to as "ratting." tout – Northern Irish slang for an informant, often one who informed on the activities of paramilitary groups during The Troubles. The phrase "drop a dime" refers to an informant using a payphone to call the authorities to report information. The term "stool pigeon" originates from the long-ago practice of tying a passenger pigeon to a stool. The bird would flap its wings in a futile attempt to escape. The sound of the wings flapping would attract other pigeons to the stool where they could be easily killed or captured. A system of informants existed in Russian Empire and later adopted by the Soviet Union. In Russia such person was known as osvedomitel or donoschik (literally, whistleblower) and secretly cooperated with law enforcement agencies such as Okhranka or later Soviet militsiya or KGB. Officially those informants were referred to as secret coworker (Russian: секретный сотрудник, sekretny sotrudnik) and often were referred by a Russian derived portmanteau seksot. In some KGB documents has also been used a term "source of operational information" (Russian: источник оперативной информации, istochnik operativnoi informatsii). 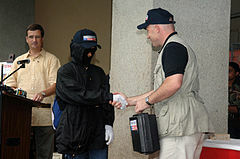 Wikimedia Commons has media related to Informants. ^ Allen, Bill Van (2011). Criminal investigation : in search of the truth (2nd ed.). Toronto: Pearson Canada. p. 217. ISBN 978-0-13-800011-0. ^ Lactantius. "On the Deaths of the Persecutors". ^ a b c "snitch". Thesaurus.com. ^ Orwant, Jon (May 22, 2003). Games, Diversions & Perl Culture: Best of the Perl Journal. O'Reilly Media. ^ "Supergrasses: a study in anti-terrorist law enforcement in Northern Ireland". books.google.com. ^ "Speaker and Structure in Donne's Satyre" by NM Bradbury. Studies in English Literature, 1500–1900, 1985. ^ McDonald, Henry (2000-10-28). "End of 'touts' in Northern Ireland". Retrieved 2018-02-01. ^ "The murky world of informers". BBC News. 2006-04-04. Retrieved 2018-02-02. ^ Coleman 1996, p. 24.